The University of Connecticut is a top ranked, internationally respected public university in the US, currently ranked 18th among US public universities. At UConn you’ll have access to world-class faculty, outstanding facilities, and exciting internship opportunities, all of which make the Department of Mechanical Engineering (ME) a smart choice for your engineering education. Whether you are a prospective undergraduate, or graduate student, you’re going to be immersed in a community of creative and smart people that are here to become the next generation of engineering leaders and push the boundaries of knowledge to address some of the world’s greatest engineering challenges. 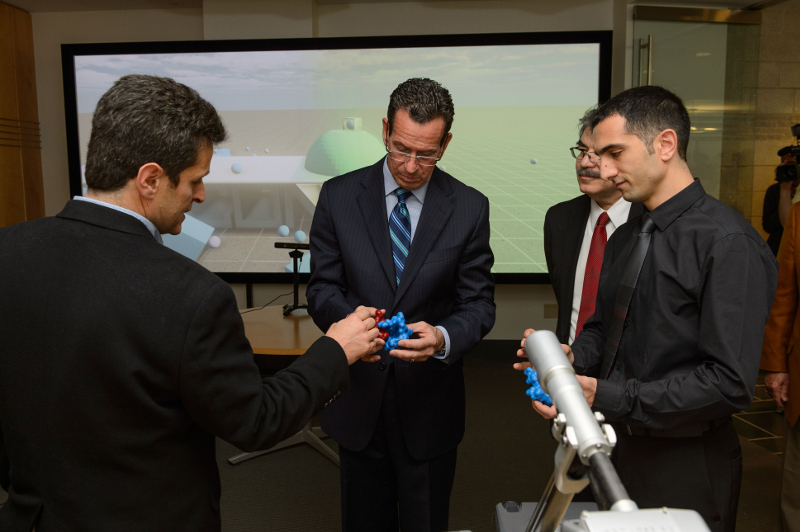 Governor Malloy @ UConn visiting the Prof. Ilies’ Virtual Reality Lab. From left to right: Prof. Horea Ilies, Governor Dannel Malloy, Dean Kazem Kazerounian and graduate student Morad Behandish.